Quang Duc, a Buddhist monk, burns himself to death on a Saigon street June 11, 1963 to protest alleged persecution of Buddhists by the South Vietnamese government. When Mohamed Bouazizi set himself alight on Dec. 17, he sparked flames far greater than the ones that would ultimately kill him. The Tunisian man, an unemployed college graduate with children to feed, had tried finding work hawking vegetables, but was thwarted by police, who confiscated his cart. So in a grisly act of protest and anguish, Bouazizi doused himself in gasoline and set himself ablaze. The act of self-immolation not only triggered the current political crisis in Tunisia, which ousted the president Jan. 14 and has led to a complicated political impasse. It also inspired copycat self-immolations across North Africa, who attempted this very sensational form of suicide as statements of their own desperation and frustration with the authoritarian regimes in their countries. The latest count of protesters who have set themselves on fire in North Africa is up to eight, with four in Algeria, two in Egypt and one in Mauritania, as well as Bouazizi's act in Tunisia. Legends of people of committing the act of self-immolation date back centuries. The first instance is said to come from Sati, one of the wives of the Hindu god Shiva. According to myths, she married against her father's wishes and then burned herself to death after her father insulted her husband. This story is often linked to the practice of sati, which was a custom in some parts of India where a widow would burn herself on the funeral pyre of her dead husband. The practice was outlawed in India in 1829. History through the ages in various parts of the world is lined with tales of female spouses, consorts and concubines being consigned to the flames, often against their will, to join some deceased warrior king or chieftain. 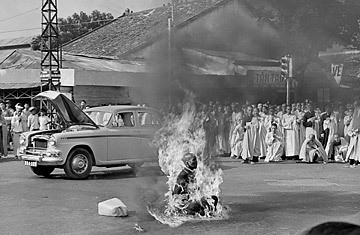 The first and most famous moment of self-immolation as agitprop was that of Thich Quang Duc in 1963. Under the rule of Ngo Dinh Diem, South Vietnam largely advanced the agenda of the country's Catholic minority and discriminated against Buddhist monks. In one of the most dramatic instances of individual protest, Quang Duc doused himself in gasoline in the middle of a Saigon street and lit himself ablaze. Journalist David Halberstam, who witnessed the monk's self-immolation and won a Pultizer Prize for his war stories, remembered the moment in one of his books, The Making of a Quagmire: "Flames were coming form a human being; his body was slowly withering and shriveling up, his head blackening and charring. In the air was the smell of burning flesh. ... Behind me I could hear the sobbing of the Vietnamese who were now gathering. I was too shocked to cry, too confused to take notes or ask questions, too bewildered to even think." The grim tactic has spread across the globe: Czechoslovaks did it to protest the Soviet invasion in 1968; five Indian students did it to protest job quotas in 1990; a Tibetan monk did it to protest the Indian police stopping an anti-Chinese hunger strike in 1998; Kurds did it to protest Turkey in 1999; outlawed Falun Gong practitioners did it in Tiananmen Square in 2009, at least according to authorities in Beijing. Only within the last few weeks have such acts of self-immolation caught on in North Africa. They seem to all come out of moments of urgency and helplessness. And sometimes they light fires in the minds of countless others in their midst.